Participants of the “Running Hearts” charity race held at the Gorky Central Park of Culture and Leisure. Participation in races, rides and other activities on the rise. On October 3, 2015, 11 Russian cities took part in World Walking Day, an event that takes place annually in more than 150 countries around the world. This was the second year in a row that Russia took place in the event, which was founded in 1992. Organized countrywide by the Russian Olympic Committee the event began in Petropavlovsk-Kamchatsky in Russia’s Far East at 11:00 local time. Each hour for 11 hours a virtual relay was passed from one city to another across the country before finishing in Kaliningrad. Russia has a history of organizing such events. Back in Soviet times, dedicated sport days, amateur olympics and fitness celebrations were held regularly and attracted many people. In 1931, the Communist Party of the USSR introduced the Ready for Labor and Defense program, a physical education plan designed to improve the fitness of the general population. On October 6, 2015 the program was revived by Russian President Vladimir Putin. According to surveys by Russia's national polling agency VtsIOM, the number of Russians participating in sports has grown from 44 percent in 2006 to 52 percent in 2014. 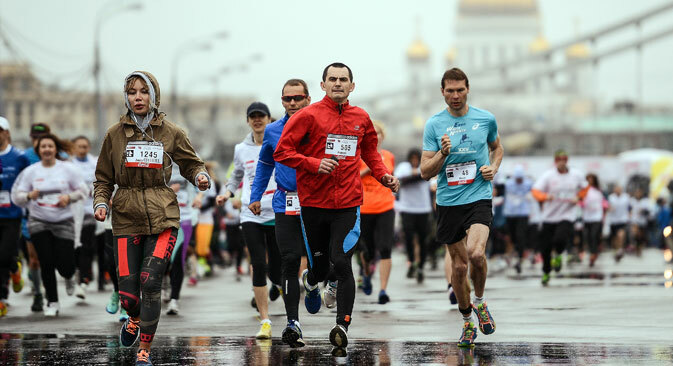 Organizers of sporting events confirm this positive trend: while in 2014 there were 9,000 registered participants in the annual Moscow Marathon, a year later the number had jumped to 20,000. Various sporting activities, including running, are being promoted not just by the authorities, but also by big sports apparel manufacturers. Adidas was able to attract 14,000 people to the competition over the course of six months. The district that earned the most points was awarded a special running facility. To encourage running unorthodox approaches have been employed. In summer, a number of cities have organized night runs under the streetlights, while in September Moscow hosted a race to the top of the Capital City skyscraper for the third year running. The race spans 1,950 steps. One of the biggest public events held throughout the country is Ski Russia, an annual nationwide cross-country skiing race. In February 2015, about 1.5 million people took part in the event in 71 Russian regions. Russian athletes and celebrities are also taking a leading role in promoting sports. In 2013, cross-country Olympic ski champion Lyubov Yegorova won Ski Russia. In May 2015, both figure skating champion Evgeni Plushenko and top model Natalia Vodianova participated in the Running Hearts charity marathon. Cycling events are becoming quite popular in Russia's larger cities. One particular event is the Tweed Run, a mass bike ride held in Moscow and St. Petersburg in which participants dress up in a traditional British style. However, participants aren’t judged by their speed, but rather their ability to select a bicycle and an appropriate costume to go with it. For several years now, Moscow’s young people have been flocking to various weekly rides called “pokatushki.” Pokatushki are informal public rides open to anyone on all types of small-wheeled vehicles including skateboards, scooters and bicycles. The ride’s itineraries change frequently and are organized primarily through social media. Meanwhile, Moscow’s best-known park has a wealth of active sporting and leisure opportunities for visitors, including karate classes, Thai boxing and qigong, in addition to hosting public football fields and volleyball courts. An ice-skating rink is scheduled to open at the park in November 2015. The park also features a number of outdoor performance stages, where dance classes with well-known instructors are held daily. “Dancing is indeed very popular – from Irish dance to rock and roll – as are yoga classes,” said Marina Li, a spokesperson at Gorky Park. Li said that there are several other new projects that are about to be launched in the park, including an artificial snowboarding hill. “We believe the popularity of sports is not a temporary trend and we are helping to promote it in Russia, in particular by holding public events,” Li said.